9am on Thursday and by the time we finished packing it was afternoon. We reached Dallas/Ft. Worth area at rush hour and it took us almost three hours to clear the city limits and we headed for the Panhandles. Night overtook us in Childress, Texas and we bedded down for the night. We rose early and after a light breakfast, headed northwest. We were making good time until we got to Dalhart, Texas where an ABS/brakelight came on, and although I had good brakes, we called the 800 trouble number. Being the 4th of July we had to wait over 4 hrs. for a mechanic to tell us we could drive it like that. We finally got back on the road about 4pm. We went through New Mexico thru the Raton Pass; quite a climb, but there would be many more climbs before we reached Tacoma. Let me set the stage for you; from the time you leave Alexandria heading northwest, you are almost on a constant climb until you reach the Pacific Ocean. We left Raton Pass on into the great state of Colorado, going through Colorado Springs and decided to sleep in Denver. On the third day we went through some of the prettiest, most majestic, real estate that I have ever seen. We went through 400 miles of Wyoming and that's when it starts to get awesome. We cut through a corner of Utah, and now I know why Smith or Brigham Young chose that state as the promised land. We went through miles and miles of Irish potato fields in Idaho and saw lots of winter wheat fields and apple orchards all over the mountain sides. We were still climbing and got up close to 8,000 feet at times. For all you hunters we saw herds of deer all over the place and 10 elk, mostly singles. I got their position marked on the map if you want to locate them (lol). Idaho was beautiful but I think Oregon and Washington take the prize. You go through mountain passes and valleys of sheer beauty that takes your breath away. We drove 2400 miles in 40 hours averaging 60 miles an hour; I'm talking driving time. That's pretty good for going up hill most of the time. When I reached the crest I put the pedal to the metal and made up for the long drag up hill. If you ever want to see the USA, I can tell you where to go. You would get your money's worth going the way we went. Don't forget, we didn't go to Yellowstone National Park and other side trips which were available nearby, time allowing. I hope I didn't bore you with our escapades but I wanted you to know why I've been away from the computer. Tacoma is a nice place to live but there are not enough Cajuns up there to suit me. Have a good one and I'll see you as I plan to be around for a spell. Recently, I've been asked by Alec and Peggy to post a message. If this starts to happen more often, I will look into some kind of message board where you can do your own posting. Until that happens if you would like to post a message for all to see send it to me and I'll post it here and send out a note letting all know its there. It's Alec your traveling Grandson, Great Nephew, Nephew, Cousin, Friend from Alexandria. If you know or not know I have been accepted to do another year of Missionary Work. It's with the same organization that I worked for when I went to Australia in 2001, The National Evangelization Teams or just NET. Only this time I feel like I have been half away across the world already so I've decided to stay a little closer to home by doing the branch here in the United States. I have decided this mainly because of easier communication lines with all of y'all and for my Mom's sanity, LOL. Now I know last time I left, it was all of sudden so this time I wanna do it right. I want to do a lil explaining about what I will be doing while I'm away for the 9 months (August 12th- May 18th). First I will be going to Music Training from Aug 12 to 22 which consists of learning a lot of music and some extra fun stuff so I can play Music on the road. On the 22nd is when the rest the 100 NETers will arrive on site in St Paul, Minnesota, which is where Training will be for 4 ½ weeks which is more or less where I find out how to do ministry here in the United States and where I will also find out who my team (10-12 people instead of just 5 this time) will be and the area where we will be going. Then after that time the Archbishop of Minneapolis will commission us in St Paul and we will be sent to our first Diocese. Then I get a little more than 2 weeks at Christmas and then I go back for the rest of the year. That's it basically in a nutshell there is a whole bunch more that goes on. Dear Larry, I have been muddling through the task of sending Thank You cards to everyone for their help and contributions to the success of the Wedding/Jambalaya. Try as we might, things were still a blur as to who did what or who brought what, for the most part. Here it is an whole month to the day later, and there are still people probably wondering what kind of ingrate has married into their family, because no Thanks has been forthcoming so far. All I know is that I LOVE this Family and everyone who is an extension of it, but am putting a bad foot forward at this rate. Larry, people brought cards, champagne, made luscious peanutbutter/chocolate fudge, "tah dah fo" casseroles and salads, pitched in and helped, cleaned,...oh migosh, as you know,it was fantastic! I tried sending a blanket-thanks to everyone on Ray's e-mail list, but, am not that computer savvy. There were people here that day that we didn't even get to say "HI" to, like Chris Robin & his wife, and others I didn't even recognize. Ray kept saying, "Oh NO!" I meant to get to talk with..." this one or that one, "They probably wondered why I didn't spend any time with them at all! Oh I feel just terrible." Larry, do you suppose you could help us let everyone know how we feel? Please maybe either teach me how to contact everyone, or post a note for everyone? 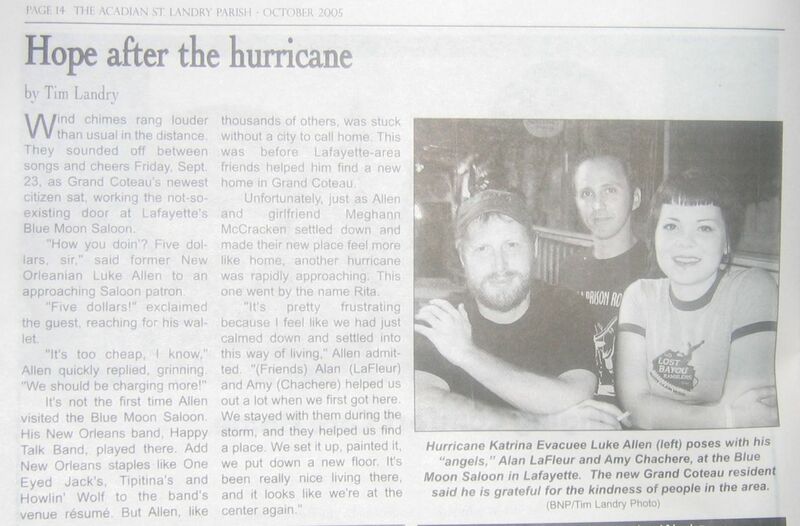 Amy and Alan were the subjects of a very nice artical in St. Landry Parishes monthly paper The Acadian. It was on 2 pages so there are 2 links. Recently the site where I hosted most of the photos for our website closed up shop and ceased to exist. I have all of the photos stored on my computer and I'm slowly readding the old photos when I'm not adding new ones. I left the titles for all the old pages where you can see them, I just made the links inactive and black. If you come across one of these sites and would like to see the pictures let me know. I have been readding at a pretty slow pace and in no real order. It is no problem to put the ones you want to look at on the top of the add list.